Apparently, according to Nigel Calder, former editor of New Scientist, Richard Dawkins needs a refresh in Genetics. Audio interview here. Interesting article on the Boston Globe regarding the ID/Evolution debate. Going way beyond don't ask don't tell...and false historical claims. Victor Hanson responds to a claim by Mike Gravel that gay is more than OK for the military. Parableman rightly chastises a church for not agreeing to do the funeral for the family of a gay man. 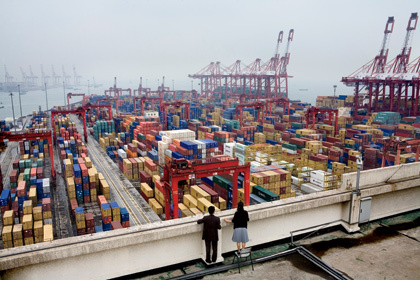 Great article in the Atlantic Monthly on the financial and manufacturing prowess growing in southern China. See China Makes, The World Takes for a fascinating read. The picture below is pretty amazing...all the little boxes are shipping containers.